Gilman USA is very familiar with the heavy-duty machine tool environment and the protection that these precision devices require in the hostile environment of chips, coolant, chemicals, etc. The linear guide slides have several standard features. They are of the wiper design as shown in Figure 1 and the side protection plate as shown in Figure 2. 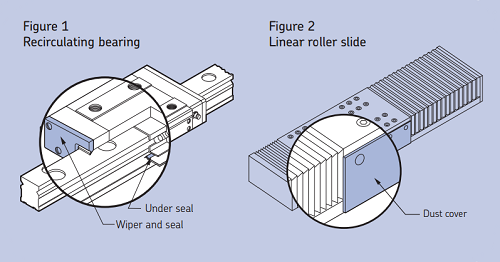 Linear motion slide protection accessories. Accordion way and telescoping way covers are offered as standard options. Gilman USA is very interested in being informed about the environment in which these slides will be applied. Using that information, we will recommend a solution from our wide array of special combinations of covers or coatings which will provide the level of required protection. We will draw from our wide array of special combinations of covers or coatings to ensure the protection required. According Way Covers Recommended for linear guides to protect bearings and screws from dust, dirt, chips and other contaminants. Collapsible metal covers with durable wipers and guides protect the bearing unit, rail and driver mechanism from contaminants such as chips and dirt. They are available on all linear guides. An oil-tight, plug-in limit switch is available on all linear guides. Both systems provide a convenient method of supplying a metered quantity of oil to the slide assembly along with the inherent advantages of safety, cleanliness and savings, both in time and lubricant. The manual system uses a pull handle pump lubricator, while the automatic system uses an electric gear motor pump lubricator with a built-in time control that can be set to provide lubrication at proper intervals (specify 115V or 230V). Both lubricators have a 1/2 gallon maximum capacity (depending on slide size). The translucent oil reservoir includes 6 feet of additional tubing so the lubricator can be mounted stationary or on the saddle. The lubricator will be supplied unmounted unless otherwise specified. Slides, rails and bearings can be treated for certain environmental conditions. These coatings can be corrosion and abrasion resistant, in addition to being a dry film lubricant which reduces friction and wear.